I have always treated Colacassia (Arbi) with the same amount of enthusiasm as kids do with broccoli or beans. For those who are wondering what Colacassia (Arbi) means, this will help. But I’ve found a way to make it more appetising. Here’s how you too can transform it from drab to fab in 4 steps! 3 tsp Coriander-Mint Chutney (Add Coriander leaves, mint leaves, green chillies, lemon juice, ginger and salt in a grinder and Blitz), 1 tsp lemon juice and finally Scallions for garnishing. Step 1 : Boil Colacassia (Arbi) and peel off its skin. Its sticky and difficult to work with but it shall get better. Chop into long french-fry like pieces. Step 2 : Dust chopped Colacassia (Arbi) with a generous amount of rice flour. This will reduce stickiness and ensure a crispy exterior later. Deep fry until golden brown. Step 3 : In a pan, add about a tbsp of oil and sauté garlic, ginger and onion until the onion is transparent. 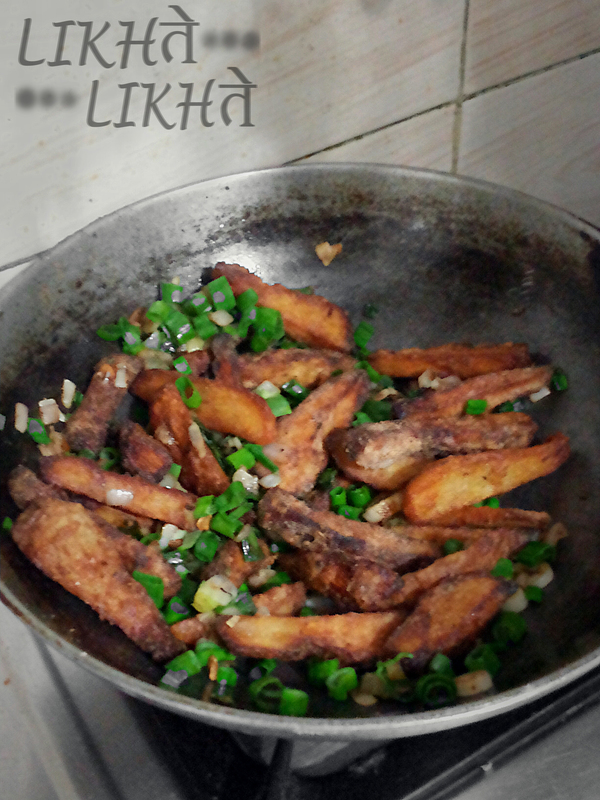 Add in the fried Colacassia (Arbi) and dry spices. Mix well. Step 4 : Mix in the Coriander-Mint chutney, lemon juice and scallions. Take off the heat and serve hot.